Rochester Scaffolding Co Ltd provides tailor made scaffolding for Industrial, Commercial and Domestic clients, we provide a reliable and competitive service to all our clients and have been operating for the last seven years throughout the Medway towns and the South East of England including London, the Home Counties and throughout the UK. We provide a seven day a week 24 hours a day call out facility, operating a strict Health and Safety Policy, Environmental Policy, Equal Opportunities, Training Policy, PPE Policy, and Quality Policy, working to SG4.15 & TG20.13 scaffolding regulations, Rochester Scaffolding Service has a strict no drugs and alcohol policy with random testing. All our employees are CISRS registered and CITB trained, with a ten million pounds public liability and employers liability cover. Supply and erect scaffolding services as to our clients specification. 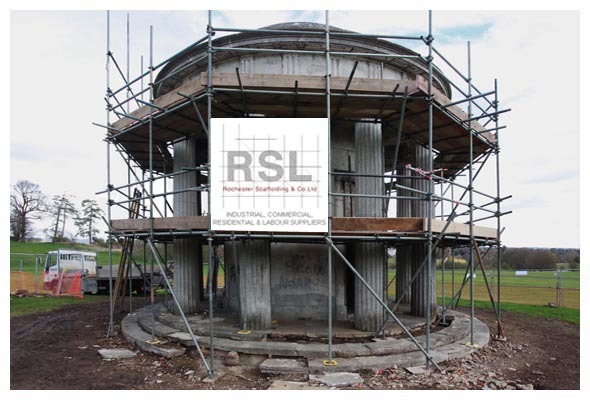 Rochester Recruitment - Labour Only Department supply labour only services for scaffolding and constuction services, and has done so, for a wide range of Industrial, Commercial and Domestic clients. Hire and sales department supplying all the scaffolding materials you may need. Rochester Scaffolding - Safety employ an independent safety advisor, who visits sites on a monthly basis for site audits. Rochester Scaffolding - HGV HIAB Lorry Hire which is cross rail compatible. New to RSL Herras fencing, and pedestrian barriers, supplied, erected or hire services available.